Qualcomm Snapdragon 700 series chipsets were just unveiled at the ongoing Mobile World Congress in Barcelona. Taking the wraps off its new range of chipsets, Qualcomm revealed that these new Snapdragon 700 series chipsets will bring some of the features of the high-end Snapdragon 800 series to lower cost smartphones. Qualcomm generally offers three range of chipsets for smartphones – the Snapdragon 800 series for high-end phones, the Snapdragon 600 series for the mid- as well as the budget segments and the Snapdragon 400 series for the lower and entry level segments. However, the gap between the chipmakers 600 and 800 series often tends to be huge; Qualcomm recognizes this and the Snapdragon 700 series aims to bridge this gap. At the moment, Qualcomm has refrained from divulging too many details about its new Snapdragon 700 series. However, the company has noted that this new series of chipsets will bring some features like the AI Engine and the Spectra image procession from Snapdragon 800 series. Additionally, you can also expect the Snapdragon 700 series to bring features like Bluetooth 5.0 and Quick Charge 4.0 to the table. 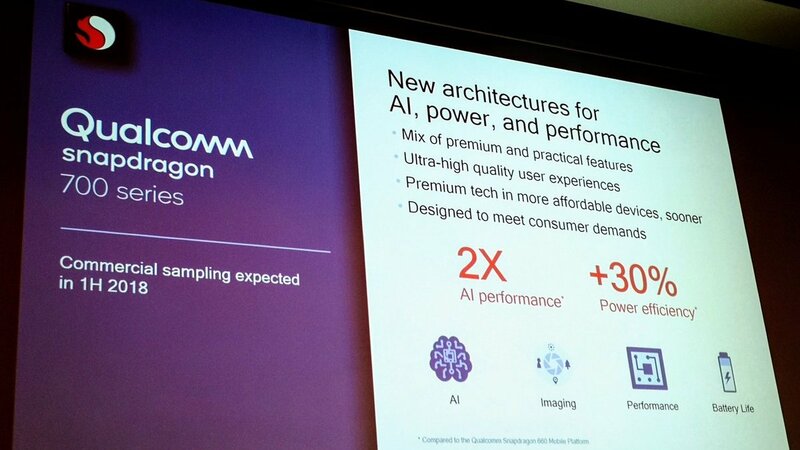 Qualcomm also says that the Snapdragon 700 series will also bring new custom Kryo cores and Adreno GPUs, offering a much more improvement in the performance when compared to the Snapdragon 600 series, but still maintain the costs lower when compared to the high-end Snapdragon 800 series. Noting this, Qualcomm revealed that users can see as much as a 30 percent increase in power efficiency when compared to Snapdragon 660. While the few details that have been revealed so far sound exciting, Qualcomm says that it will start delivering the first samples to its clients in the first half of 2018. At this point, its manufacturing clients will then start evaluating the manufacturing process – the final manufactured chipsets may take even longer to be ready to be shipped. Still, the Snapdragon 700 series announcement comes at a time when the prices of smartphones are increasing, so it could help those buyers who are looking for a greater value for their money at lower costs.